Alynda Lee Segarra doesn't have a problem writing personal lyrics — she just doesn't share them often. The ones she does offer for public consumption through her band Hurray for the Riff Raff are folk songs from a storyteller's perspective. Though the 27-year-old has been crafting lyrics for more than a decade, it's only recently that she's tapped into her political side. "I don't have a problem not writing personal songs," Segarra says from her New Orleans home. "Most of what I write I don't share with anyone and it's mostly love songs. If I can stay open to the world and what's going on, I will always have something to say. It's about being open and not closed off." After hearing about the woman who was gang raped and murdered on a Delhi bus in 2012, Segarra's anger fueled her to write the song "Body Electric," a murder-ballad about women who are victims of violence. "Everybody Knows (for Trayvon Martin)," a song posted online one year to the day after the 17-year-old was killed in Florida, is now being used for the band's Indiegogo campaign for The Body Electric Fund. The fundraiser, which supports organizations promoting peace such as Third Wave and the Trayvon Martin Foundation, also aims to get a video made for "Body Electric." With less than two weeks to go, more than 70 percent of the $10,000 has been raised. "I would like to look back on 'Everybody Knows' and say, 'That was a song for that time period. It was such a sad time and I'm glad we learned a lot from it and I hope Trayvon's mother is getting the support and healing she needs,'" Segarra says. "I feel like right now in this country there is a lack of respect for young black men's lives and black women. I'm really disturbed by it. I'd like my music to do something for it and I hope it does." A good bit of Segarra's political mindset came from growing up as a punk music fan in New York City. She loved the live shows, the sense of community and being a part of a world where young people lived by their own moral codes. 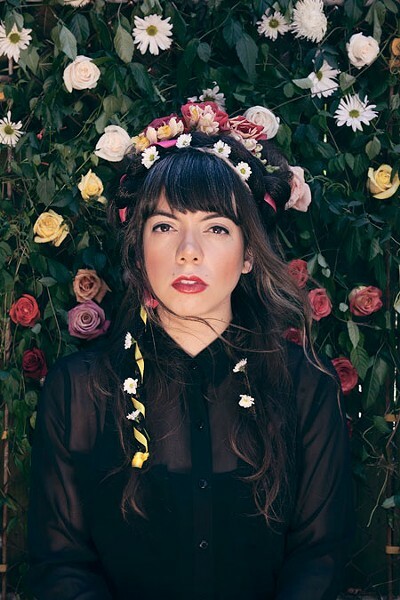 At age 17, she began hopping trains around the country and listening to a broader range of music, which influenced the Appalachian style heard on Hurray for the Riff Raff's 2014 album, Small Town Heroes. "I grew up listening to early Motown and doo-wop and then I was traveling and learning about American folk music," Segarra says. "It's so rewarding to me to work within a traditional medium and put our own little spices in there to make them feel new and very much like us." While Hurray for the Riff Raff has earned plenty of critical praise for its music, "The Body Electric" and "Everybody Knows" seem to be resonating more with media and fans. "Every time someone tells me that it has affected them or made them feel something, whether it's comfort or anger ... A lot of what I get is 'I'm so glad someone is saying that,'" Segarra says. "It helps people see that someone else cares and is angry. I feel like I'm doing what I'm supposed to be doing in life." Tell me what's a man with a rifle in his hand gonna do for a world that's so sick and sad? "These are two songs that are talking about the feeling of being prey — 'I hope I make it home tonight; I hope I'm safe when I leave work'," Segarra says. "They are everyday ideas that are really plaguing people and I love bringing them out into the forefront. It's not personal, it's political." Segarra did have some hesitation in getting overly political with her music, but tried to approach it in a way that wasn't "corny or preachy." She just wants to be honest with her listeners — truthful about who she is and what she believes in. "I feel like [music] is the perfect way to get ideas across," she says. "We live in a society that's — we've been taught to turn off our ears and eyes. I'm trying to do what feels right to me, even if people don't listen. It's worth trying."